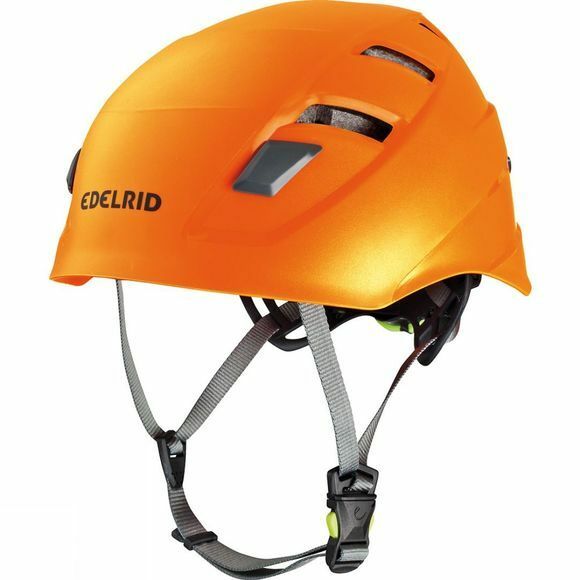 The Zodiac Helmet from Edelrid is a lightweight and extremely stable hybrid helmet which is perfect for climbing, mountaineering and via ferratas. It has a robust and impact-resistant injection-moulded ABS shell with an expanded polystyrene foam inner shell for reliable shock absorption. The wing-fit system and rear adjustment dials ensure that this helmet fits all sizes and guarantees outstanding safety as well as comfort. In addition to this, in order to aid comfort, the chin strap is fully adjustable and the closure system sits just under the ear to avoid any chafing. The large vents allow a constant supply of fresh air to keep you from over heating. There are four robust head torch clips to keep a head torch from slipping off if you are out in the dark and the cradle of the helmet folds inside which significantly reduces the pack size when it is not in use. It is also supplied with spare padding.